CHICAGO, IL – Sharon P. Carson the author of the original title; Act Like A Lady –Think Like A Man, watched the February 27th episode of the Ophra show on which Steve Harvey was promoting his book of the same title. She was hoping that Steve would reveal to Oprah where he got the title and the theme for the book. It just seemed odd to her that his book had the same title and theme as her book that was copyrighted in 2003. Thinking of all the self - published poets and authors like herself who have a hard time finding publishers for their materials, she was hoping for perhaps some recognition that the idea for the book might have come from her, especially since upon subsequently purchasing the book, she found some interesting parallels. But then she thought that it was not unusual for a high profiled person to take a great title and theme, rewrite a book and use their celebrity to sell it. This she says happens too often to the unsung poets, authors and entrepreneurs of the world. Steve wrote in his book that his hope was to “empower you with a wide-open look into the minds of men”. Sharon P. Carson wrote in her book in 2003 that women need to gain some insight into how men think in terms of relationships. Sharon also noted that in chapter 8 of Steve Harvey’s book titled “Why Men Cheat” he came to the same conclusion that she did in chapter 37 of her book, titled “Why would a man cheat”; “because they can”. Sharon actively promoted her book before the release in January 2009 of Steve Harvey’s book and would not like to see her promotion efforts hindered. She feels that her book has much to offer from a woman’s perspective and seeks empower women to practice self love and tough love in relationships. 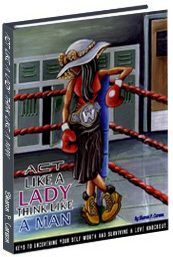 Before the publication of Steve Harvey’s book of the same title, Sharon bought the domain name; www.actlikealadythinklikeaman.com from which she has been selling her book. She has also held seminars with women at a Chicago University in promotion of her book and can be viewed on the following youtube clip as she was being interviewed on a cable television program about her book in 2007 ; http://www.youtube.com/watch?v=xxVVQX15X2Y. Sharon hopes that her earlier book with the same title will finally receive the recognition it deserves and is currently consulting with attorneys regarding her options. The BLACK ONLINE NEWS NETWORK (BONN) is the largest and fastest growing network of news oriented websites targeted to African Americans. Websites in the BONN network are updated daily with the latest National, International and Topical News.